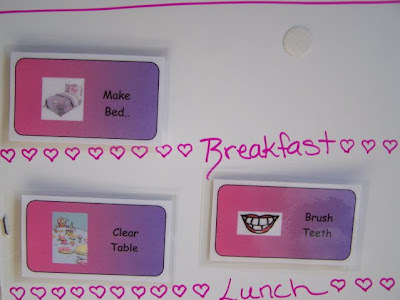 Here is our chore charts that we made to keep the kids on track with their duties that need done everyday. I got tired of always repeating myself day after day, and always having to stay on top of them. Now it is clear what they are supposed to do each day, and they have a reward system set up for accomplishing it. I made these using American Greetings Spiritual Expressions computer software, but you can use just about any print program, or the kids can have fun making their own cards! Each child has their own chart made out of poster board. 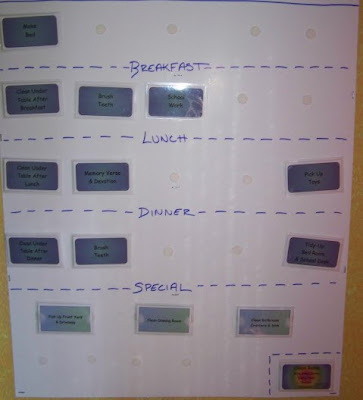 There are places set up for what they need to do after before and after breakfast, after lunch and dinner. When the chore is done, they place it on it's spot on their chart. The girls have pictures along with the words on their cards since they can't read yet. There are chores that are to be done everyday at about the same time everyday, and then they have a "clean room" card that I put up on the day of my choosing, and that means they have to do a full room cleaning...laundry downstairs, sheets stripped, trash out, vacuum, etc. They also have special chores that we rotate or roll dice to choose who gets to do that chore for the day. It keeps things more interesting when they don't have to do the same chores every day. The anticipation of who gets to do what is so fun for them too! 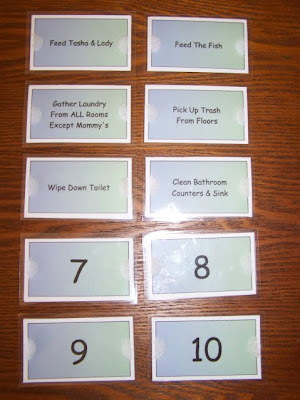 1-6 are easy chores that the oldest 3 get to rotate or roll for, and 7-10 are harder chores that only the boys share. They are put on the charts after it is decided who will do them that day. 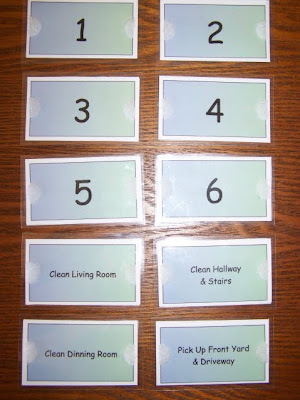 We put the chores facing out, and when they are done, we turn the cards around so the numbers are showing. Now for the reward system, if they do everything that day that they are supposed to do, they get a designated amount of money for it. If they don't do it, they don't get the money, and they get a consequence decided on by their father. I made "badges" each with a different amount of money on it. I keep them in a basket on my desk. There are 5 spots for each child on the money chart. 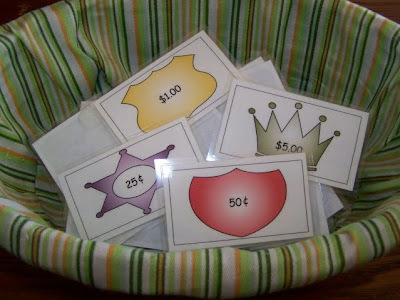 Once they reach 50cents, they get the 50 cent card, then when they reach $1.00, they get the dollar badge, and so on, so we've never needed more than 5 spots. They can earn extra money by doing extra things or jobs for Mommy or Daddy. Only Mommy can take up or take off the money badges. We've been doing this for over a month now, and it is so nice for me to be able just to ask them periodically, if they've done their chart, or ask them to check their chart. It's much more fun for them and they feel like they are getting results from their hard work. Let's face it, children aren't all that thrilled about just having a clean and organized home! It does make it feel more like they are a part of the family too, than doing "chores". I just wanted to stop by and say Hi. Hope you have a wonderful Valentine's Day! Thanks so much for posting this again! One of these I'm going to sit down and study this and revamp our system - thanks Kristi!